Grangegorman Military Cemetery | Come Here To Me! « A follow up to that post on the Battleship Potemkin. As mentioned before, last weekend was a busy one for CHTM! with involvement in the Punky Reggae Party gig on Friday night, the Sounds of Resistance gig on the Saturday night and the latest pub crawl scheduled for Sunday afternoon. Before the pub crawl though, JayCarax had lined up a walking tour of Grangegorman Military Cemetery for us, led by Ray Bateson, author of “They Died by Pearse’s Side,” historian and specialist on those killed in the Easter Rebellion, 1916. We were joined on the tour by comrades from Story Map, the Chasing the Light photography blog, and Irish History Podcast. Grangegorman Military Cemetary lies 2.5 miles from the GPO, but ask any Dubliner about it’s existence and who’s buried there, and you can be guaranteed you’ll get a blank face from the majority of them. 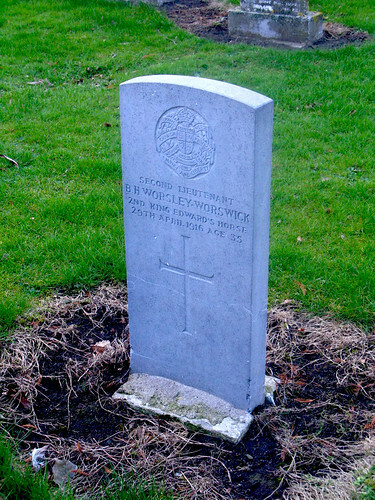 Located on Blackhorse Avenue, not far from The Hole in the Wall pub, it is the resting place of British soldiers who died or were killed in action on this island. 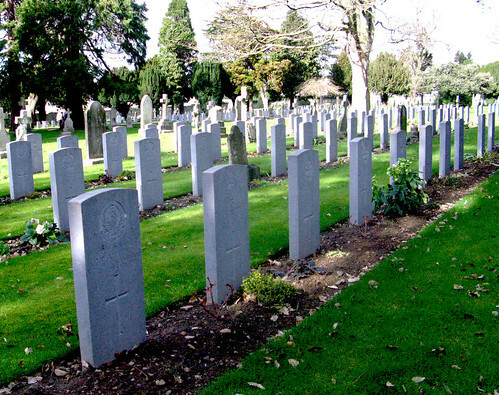 Whilst, for obvious reasons, a large portion of our interest was given to those who died on Easter Week, there are graves scattered around of those who came/ were sent here to recover from wounds received in the trenches of World War 1 and a long line of graves for those who died in the sinking of the RMS Leinster in 1918. Military casualties (not counting police) in the Easter Rebellion were around the 120 mark, with those killed serving a variety of different battalions though most notably, large numbers from the South Staffs and the Sherwood Foresters battalion, killed in the Battle for Mount Street Bridge. 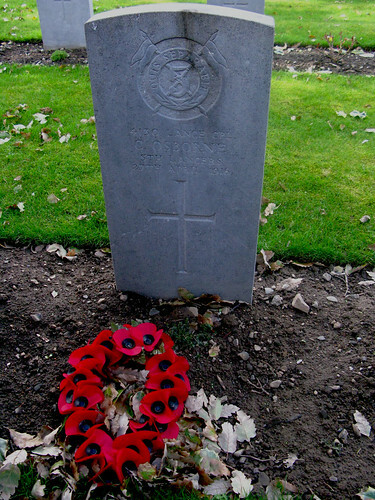 Battalion badges are marked on the headstones along with the name of the person buried, their rank and the date of their death whilst a very few have personal inscriptions. Matching the battalions and dates from the gravestones with the known events in Easter week can give us an idea of where these British soldiers met their deaths. 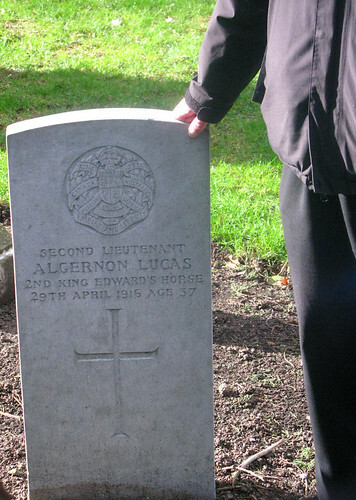 The grave above bearing the date 25th April and the soldier’s battalion, the 5th Lancers, suggests for example, he was wounded the ambush of the ammunitions convoy by Ned Daly’s garrison at the Four Courts and died the following day. The above name may or may not ring a bell with you. Guy Vickery Pinfield was given mentions in several Irish media outlets last week when a locket dedicated to his memory sold at an auction in England for £800, twice it’s estimate. 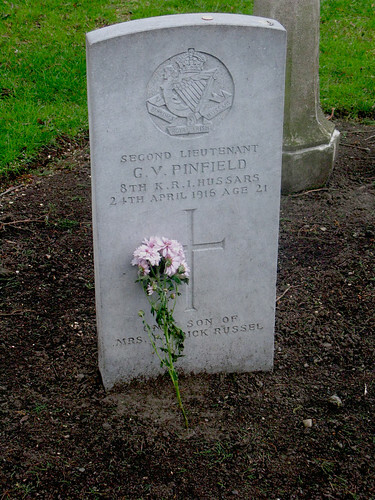 Pinfield, like a majority of the soldiers (and indeed rebels) involved in Easter week was a young man, being only 21. He was shot through the heart whilst on guard duty at Dublin Castle on the 24th. He was buried in a temporary grave in a garden at the Castle, where he lay for 46 years until he was exhumed and reburied in Grangegorman. You can see an image of the Pinfield locket, here. A story I had never come across before was of the graves above and below this paragraph- that of Algernon Lucas and Basil Henry Worsley Worswick, both shot by their own side (alongside two civilians) in the Guinness brewery, falsely accused of aiding the Rebels. A Company Quartermaster Sergeant Robert Flood of the 5th Batt. Royal Dublin Fusiliers stood trial for their murders but was acquitted. You can read about his trial here. The graveyard itself is maintained to Commonwealth War Graves Commission standards and is itself beautiful to look at, and definitely worth a visit if you have an interest in Irish history. It is easy to forget that there were two sides of the story on Easter Week; alongside the Rebel dead lay the bodies of English soldiers, many of whom were members of the army by lieu of, as Connolly said “conscription by starvation.” Many had not fired a rifle in anger before, and whilst shot down leading repeated charges on Mount Street Bridge under the orders of contemptuous senior officers, thought that they were fighting on the streets of France. Many thanks to Ray for the tour and to the other Bloggers for coming along. If interested, you can find a few more pictures of the cemetery here. I agree with my good buddy Póló as I was never aware of this military graveyard. Will look it up next time I’m in Dear Dirty Dub as I have an interest from my own travels in WW1 from the Irish perspective, the defining and polarising moment in our modern history. Here was my journey. Pólo / Dave, cheers. I could have ranted on and on with different stories Ray passed on to us on Sunday but maybe its better for people to go out and have a look themselves! Bitzy, it was the Military Cemetery that we were in! i do know that st.brendans was captured by the rebels in 1916 so i have obviously mixed that up. We were also joined by Riders Block blog. Sorry Eoghan, missed that one! Madigan, have seen those graves from the top of the bus and have always been meaning to drop in and have a look, cheers for the link! I’ve always heard the ‘streets of France’ theory bandied about but is there any proof for this? Did British infantry say it in interviews afterwards? Good piece and sorry I missed it. As kids, we used to play in this graveyard and wander amongst the uniform headstones. Later found out my wife has family members buried here. Glad to hear bitzy is looking forward to the queens visit, she might drop in to cummos for a quick half. Also interesting that Senator Mooneys deeds refer to Grangegorman as my own refer to the barony of Castleknock while everyone knows I’m in the heart of Cabra. This graveyard is well worth a visit, a piece of our ‘troubled’ history. on March 4, 2011 at 10:02 pm | Reply Pub Crawl, January 2011 (Pubs 79-83) « Come here to me! Absolutely brilliant post. I was going to do something like this myself. I do hope the queen visits their graves, it’s the least these forgotten men deserve for giving up their lives for her grandfather. on October 10, 2013 at 7:21 am | Reply Dublin’s Pere-Lachaise: Mount Jerome Cemetery | Come here to me!